Everyone knows the way to make your wardrobe stretch is to remix it with other items in your closet. That's why I loved this style challenge from FabKids! With the Bow Back Ponte Dress from the Tutti Frutti Collection, I was able to create 5 different outfits for Arianna to wear - now and later! Take a look to see how I styled it, and let me know how you would style the dress too! 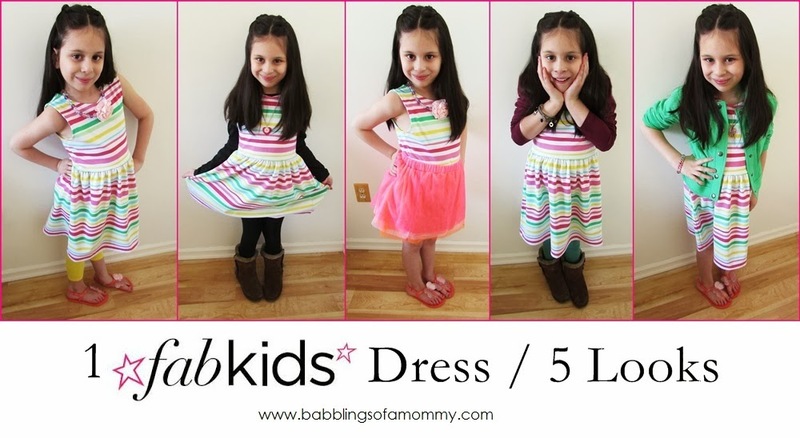 FabKids offers 2-piece outfits for only $29.95, but you can also mix-and-match to create your own outfits like I did! Styles start at $14.95, plus they offer free shipping on all orders over $49. The dress is so cute and your daughter is so adorable! I think a denim jacket or a moto jacket on her would look cool too! A denim jacket would be perfect! I have to get her a new one because she outgrew her old one. Thanks for stopping by! Your "model" is adorable! What a versatile piece. I love how you styled it for different seasons. Thank you! Yes, you always have to think about versatility with kids.